Vienna, Austria is like an elegant, beautifully adorned grande dame of European cities. Its wide streets lined with intricately designed buildings, green spaces, and lavish sculptures, plus a truly impressive list of great artists and composers that are still celebrated, make this locale a fantastic one to check out. 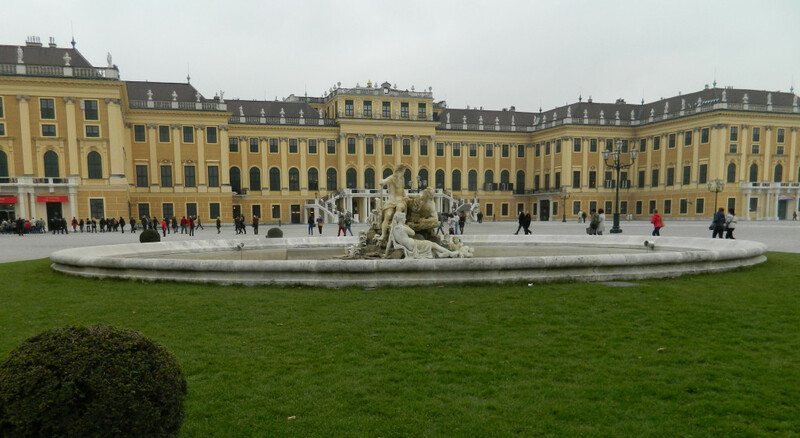 The word palatial should have been created for the sprawling, light yellow Schönbrunn Palace, located on the outskirts of Vienna (and easily accessible by the metro). Commissioned in the 17th century and finished under Empress Maria Theresa, this summer residence for the royals is simply stunning. 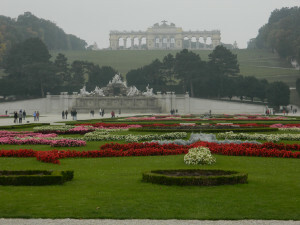 In fact, Schönbrunn means “beautiful spring.” Guided or recorded audio tours include most of the palace’s opulent rooms, including a grand ball room, bed chambers, private dining rooms, and the study of Emperor Franz Joseph – who was married to the universally loved Elisabeth, popularly known as Sisi. You can also visit the room where a 6-year-old Mozart played one of his first public concerts. No matter what the weather (and it was rainy when we were there), definitely make time to wander around the glorious gardens that surround the palace. In addition to the flowers, tree-covered paths, and fountains, it also houses the Vienna Zoo, which was founded back in 1752. Or if you’re feeling especially energetic, climb the steep and winding path up to the Gloriette for truly unforgettable views. It’s also worth checking out the city residence for the Habsburg dynasty. 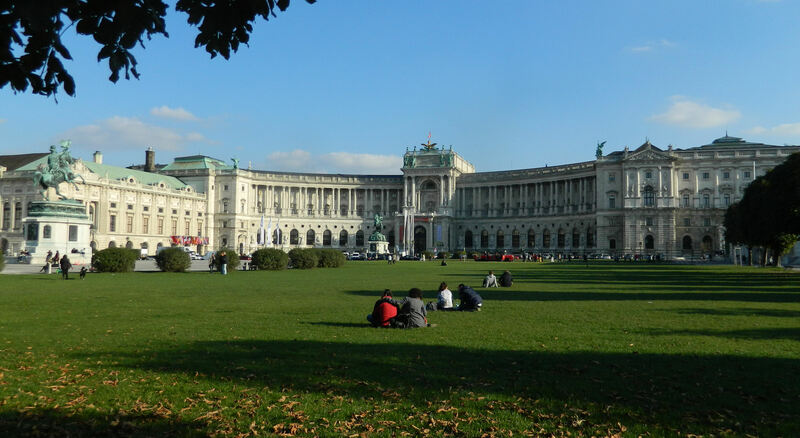 The Hofburg Palace is equally as impressive, if less colorful, than the Schönbrunn and currently houses the President of Austria. Guided tours are provided here of the imperial apartments and the Sisi Museum. The grounds also include the Gothic Imperial Chapel, where the Vienna Boys’ Choir performs, and the Spanish Riding School, which includes shows by the famous Lipizzan horses. This huge building is located right in the middle of the city center and in front of the popular pedestrian mall. Based on its locale, it’s a great meet up spot with fellow travelers, bus tours, and vendors hawking all types of crazy things. 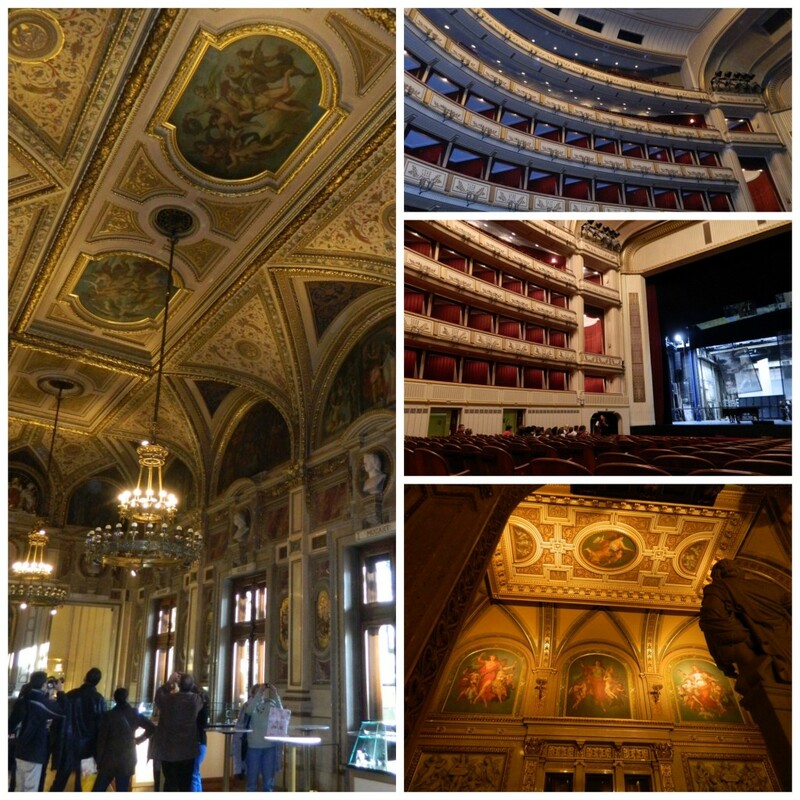 But the interior of the Vienna Opera House is a refreshingly calm, albeit lavish, respite from the fun but chaotic outdoor antics. Be sure to book a 40-minute guided tour for views of the main foyer, Marble Hall, auditorium, and even back behind the stage. Not bad for just a $9 ticket! 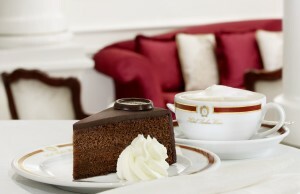 This very dense but moist dark chocolate dessert was first created in 1832 for Prince Wenzel von Metternich of Vienna. 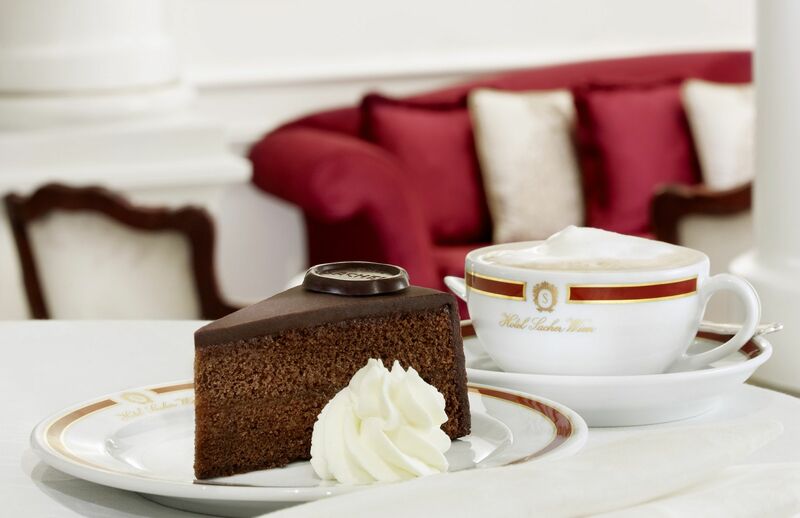 Although both the Hotel Sacher and the Demel bakery lay claim to the Sacher-Torte, I was only able to try the offering from the first and cannot recommend it highly enough. Wowza! I previously wrote in detail about this bit of chocolate decadence, but suffice it to say: if you ever get the chance, GET ONE! Or better yet, get two. One to enjoy immediately and one to savor later. I’m seriously looking into the costs of ordering one (or two!) from the company now that I’m back in the States. YUM!! 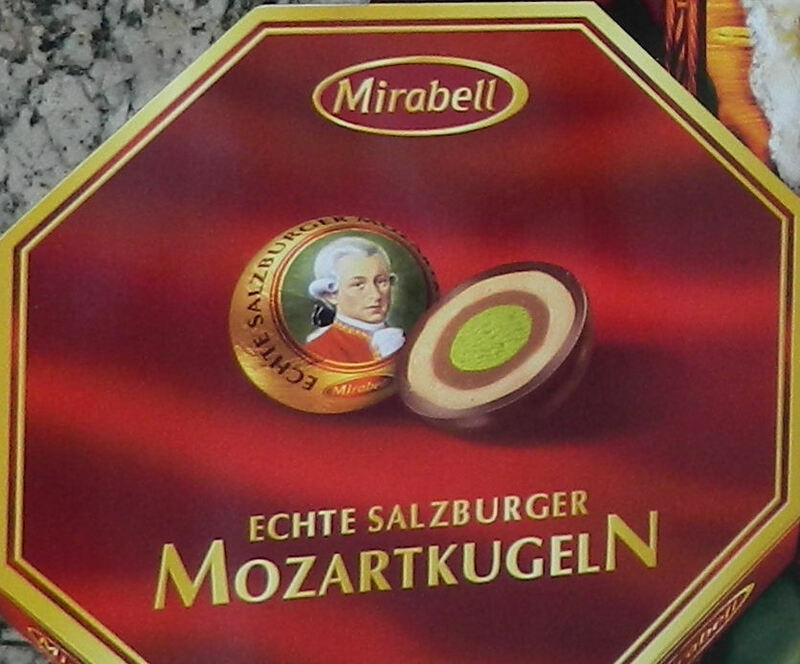 My love of chocolate carried on with my introduction to Mozartkugeln, which literally means Mozart ball or Mozart bonbon. This candy was first created in Salzburg in 1890 but has branched out to all areas of Austria. The original recipe for each individually wrapped piece calls for “a ball of green pistachio marzipan covered in a layer of nougat” or praline cream and then dunked in a dark chocolate coating. Some places make a few variations on this, but most pretty much follow the recipe. Seriously, you can’t eat just one! All I can say is: these things are addictive! Thank goodness for the individual wrapping – I think that’s the only thing that kept me from trying to eat 5 or so at a time. By the way, unbeknownst to me, my Mom bought an extra box of these and hid them away until the holidays, when they appeared like magic in the family’s Christmas stockings. What a fantastic treat from Santa my Mom! 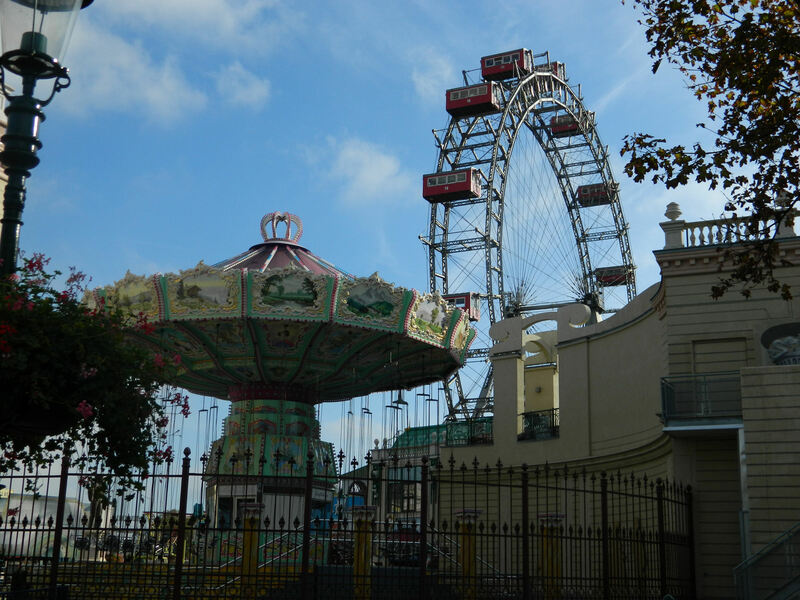 The Wiener Riesenrad (“Viennese giant wheel”), is a Ferris wheel that stands 212 feet tall at the entrance to the Prater amusement park. As someone who has published many ride reviews, I was incredibly excited to try this – even if it was built back in 1897! 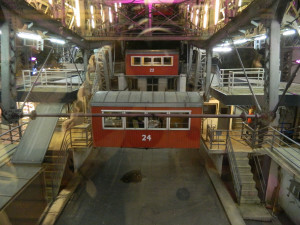 The Riesenrad has 30 completely enclosed gondolas, which look like individual train cars. Inside, there are windows on each side and a bench in the middle. And although the ride is very high, it is also very slow. So anyone can take advantage of its spectacular revolving city views. 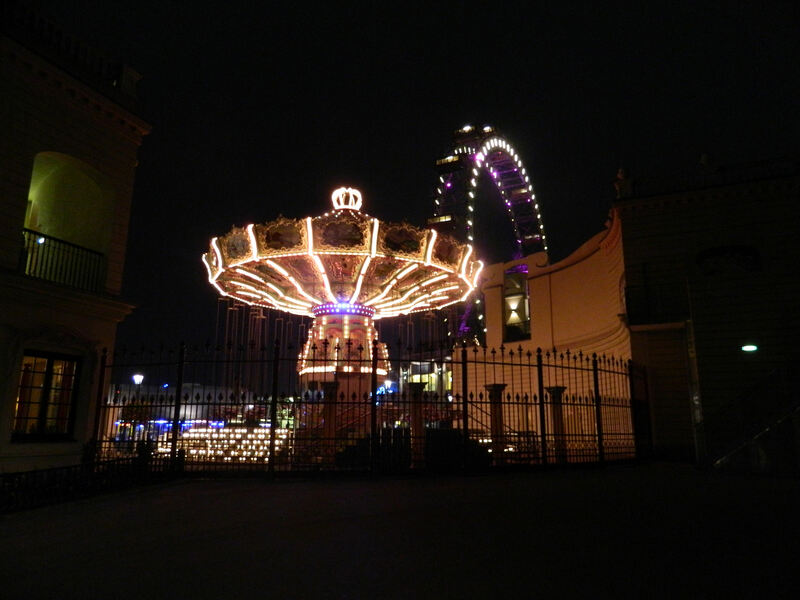 And at night when we rode it. In fact, the night we went, we actually saw a couple having a beautifully laid out sit-down dinner in one of the gondolas. We couldn’t see if the young man was proposing, but the 5 of us in our car were cheering him on anyway. 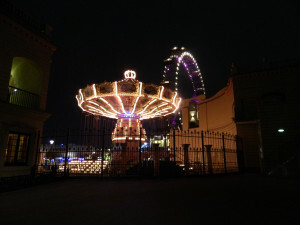 By the way, this ride can be seen in the 1949 Orson Welles film The Third Man, the 1987 James Bond film The Living Daylights, and the 1995 film Before Sunrise, with Ethan Hawke and Julie Delpy. And that’s my top 5! But stay tuned, I’ll be writing about more great finds in the Vienna area all this week. 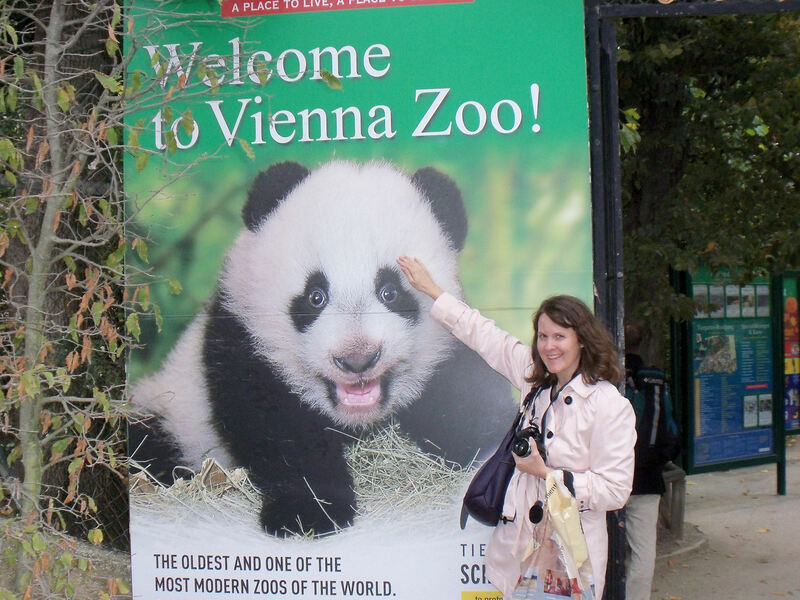 My one and only trip to Vienna was so awe-inspiring. Beautiful palaces, museums and galleries plus wonderful restaurants to explore. I hope to go back some day because there was no way we could see everything in the short week we were there. I highly recommend this to any traveler. I agree with everything you said! It’s such a clean, orderly, and beautiful place. I would definitely love to go back. The beauty and elegance of Vienna’s Royal Homes are rivaled only by those in France…rivaled but not necessarily surpassed. And, well, chocolate in all it’s various forms being a serious draw for me…the Sacher-Torte and Mozartkugeln are good enough reason to go to Vienna even if there were no others. 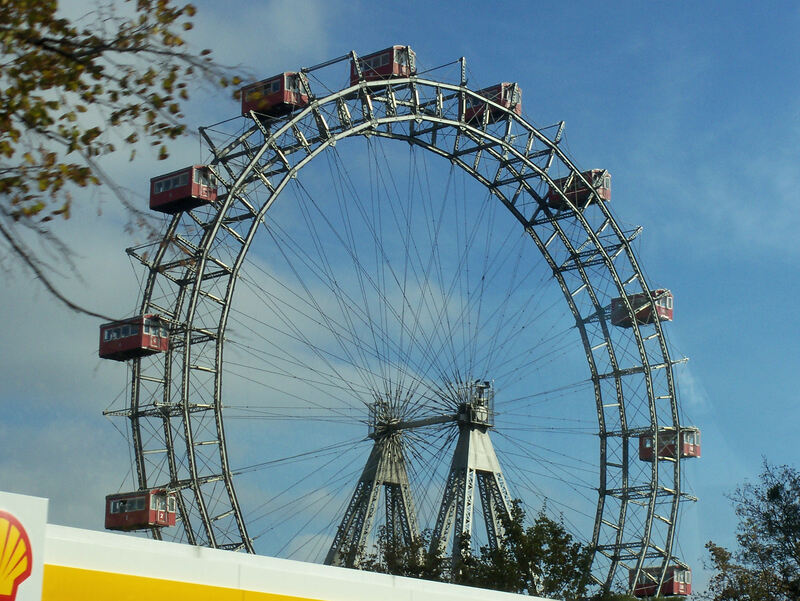 Wow, the Giant Ferris Wheel is a serious GIANT! The last photo of the cars at the bottom of the wheel look like a disarranged train station. Thanks for sharing all of this with us. I travel the world vicariously through your blog. Thanks Sandy! The Royal Homes were gorgeous, as are so many in Europe, and the chocolate was soooooo good I still crave it. And you’re right about the Ferris Wheel’s gondolas looking like they were pulling up (a bit wrong!) to a train station. I’m an adrenaline junkie so was hoping this would be a little bit scarier, but it was a very pleasant ride and the views couldn’t be beat. 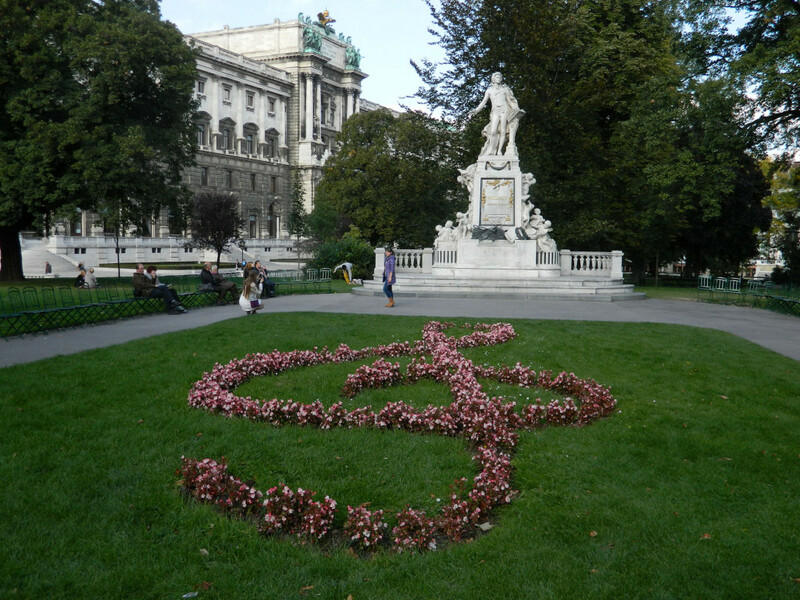 I had the priviledge of spending a day in Vienna with Don, Gary and his wife Tracey. 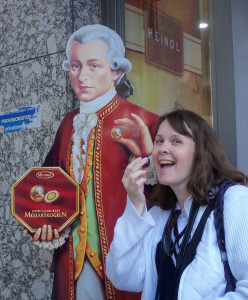 We attended a concert of sorts in honor of Mozart. We saw beautiful fountains and parks full of flowers. Sounds like a really lovely visit Jimmie. The only thing we didn’t get to do was hear any Mozart or any other type of musical production. I’ll have to add that to the list if I ever make it back. How cool! I would LOVE to visit there one day. How beautiful! 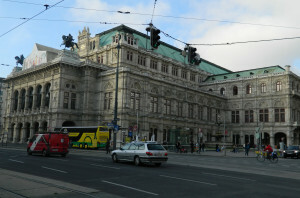 Vienna is on my must see list! I don’t think you’ll be disappointed. Just be careful where you walk. The buildings are so beautiful and all so interesting that I kept walking while looking straight up – and nearly walked off a curb several times. Yikes! Hello Deborah, I love reading travel posts, especially when they take the reader to the Old World. I’ve been living in the DC area for a while and the thing that I miss are those palatial gardens to stroll in. No matter the weather or season there is always something special about being there. 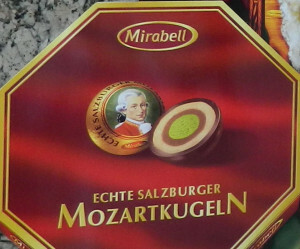 Mozart Kugeln are probably some of my favorite treats and I splurge during Christmas on this delicacy. Happy to hear you had a great time! Also, glad to hear from someone else who appreciates those wonderful Austrian chocolate balls. In fact, I’m craving them now.